Snowflake Tiara consists of two stories intertwined in the Miss Snowflake Pageant over the course of 125 years. The first, The Debutante Queen is set in 1889 Helena, Montana and is written by Angela Breidenbach. The second, More Than a Tiara is set in 2014 and is written by Valerie Comer. Both stories are wonderfully written and draw the reader into a world of beauty, jealousy and humility. 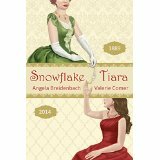 The Snowflake Tiara is a fantastic compilation of both stories and definitely worth reading. I loved each story equally but for very different reasons. In The Debutant Queen, Ms. Breidenbach weaves a tale of a young woman, Calista Blythe, who is beautiful inside and out. She finds herself in the right place at the right time when a little girl hides herself near Calista to escape a horrid man. The man is the young girl’s master as she’s been bought into indentured servanthood but he’s a harsh taskmaster and abuses her. Bound with compassion for the little girl, Lea, Calista finds herself hiding the child while desperately trying to find a home for Lea. The irony of the story is that Calista’s family is very wealthy and could easily care for the child but The Blythe’s aren’t interested in becoming the next orphanage and urge Calista to pursue winning the Miss Snowflake pageant as a way of helping children instead. In More Than a Tiara, Valerie Comer tells the story of Calista’s great, great, great granddaughter, Marisa Hiller. Marisa is no stranger to modeling and the realities of a life built upon beauty but she has chosen to lay it all down to help her mother farm in Montana instead. After a horrible fight with her boyfriend, Marisa returns to Montana to start a new life. Before she knows it, her new life suddenly encompasses parts of her past. In a crazy turn of events, Marisa is enrolled into the Miss Snowflake pageant. She has found a calling and loves helping women and children through food provisions and education. Not exactly the high profile charity that people expect, but Marisa is passionate. As she completes the required areas for the pageant, she finds a new awakening to the dreams she had left behind several years ago. An old love may find a new way into her heart as well. Both stories are so absolutely delightful! I loved every minute of them. I received this book from the authors in exchange for my honest review as I’ve provided here.